Jason saying that JAce wants Jason out this week real bad. points out that Jace is pissed because he wasn’t picked to play in the POV. 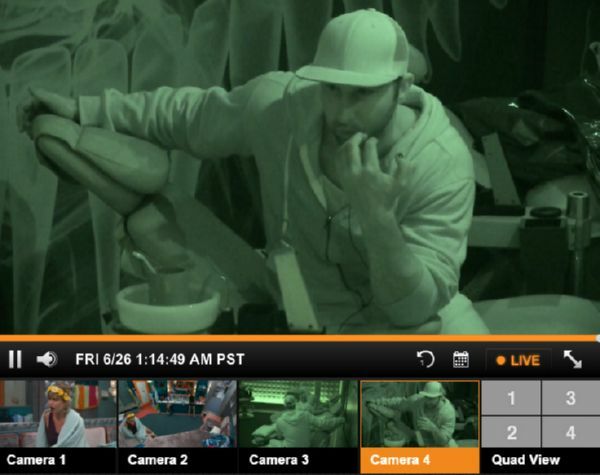 Jason wants to win the POV for himself adds he thinks if John And Becky win it they can convince them to use the POV on Jackie. They mention how grainy the head of household spy screen is. 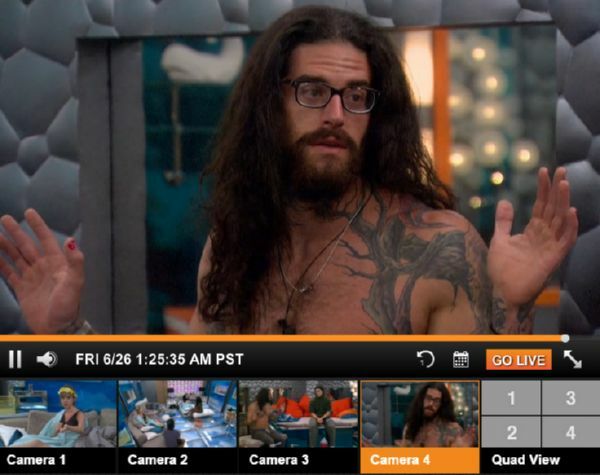 Steve points out how weird it is them sitting in the HOH watching the downstairs nail party. He feels it hasn’t sunk in that he’s in the feeds yet. Jace is getting pissed off by someone he’s about to lose it. 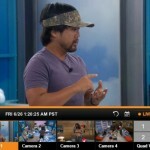 Jace tells Steve Big Brother is a marathon. DAVonne thinks Vanessa is playing with herself or she’s playing with the guys. DAvonne has noticed Shelli talking game to clay and Meg. Vanessa says she gave Austin immunity because she felt he can win HOH and keep her safe. Vanessa says she doesn’t feel good in the Big Brother house says not being able to talk to people without arousing suspicions is very difficult for her. Adds that she misses her girlfriend. Austin and JAce are close. Jeff and Austin had an altercation earlier in the week Austin hurt Jeff’s feelings. James think sJace doesn’t feel 100% comfortable right now so he might be talking to Steve for information. Jason and Audrey say Steve thinks he’s the pawn. 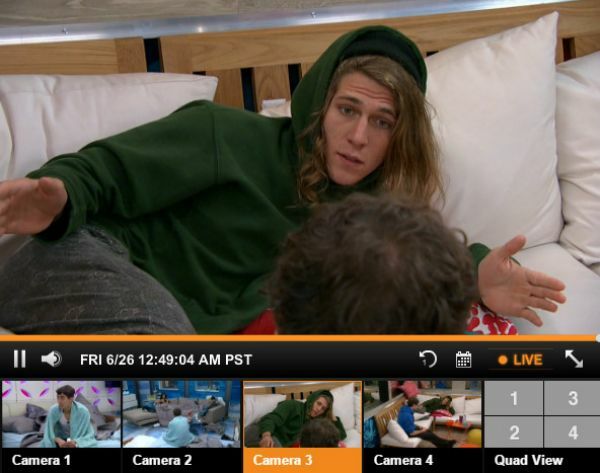 James – Jace is trying to form an alliance right now he pulled me Austin and he’s trying to get Clay. Him and Austin don’t trust Jeff. James tells them he saw Steve and Jace talking and when they saw James noticing them Steve acted sketchy. James brings up Jace telling him to put Becky up. Audrey thinks James should go tell Becky that. Audrey mentions Jeff is now saying if he wins HOH he’s going after Austin. Meg says the best thing to happen was Jace and Austin saying they are after Jeff. They agree Jace is going up because he’s annoying and a threat. Megg brings up jace trying to form alliances early in the game. Jace points out how “F****g” Caddy Audrey is. they are thinking Audrey told jason they are coming after him. They agree they can trust each other, Johnny Mac and Liz, the house is talking too much. They want to try and shore something up with James to make sure the correct move is made. Jace – everyone here has such a big f*** mouth I should have never said anything to Jeff. 1:33am showing the feed camera their nails. Welcome to Big Brother dude. HAHAHA. I think this is the first time that I’m actually rooting for the ‘big alliance’ (aka HOH crew) the first week. Jace is just too much for my liking. By the looks of it he tried to play it like Captain Canada but his social skills is not up to par. Can’t wait for him to go out the door, sadly for Grodner her surfer dude this year is just not as cool as the previous ones. When has there been a surfer dude who made if far into the game? I think Hayden is the only one who has ever made to Jury. He still went out early too. Technically Hayden is not a Surfer dude… Arizona isn’t known for it’s surfing LOL. Hayden was that Seasons Frat Boy.. Two Frat Boys have won Big Brother Drew and Hayden. Surfer/ Skater Boys go fast last year was the farthest a Skater/ Surfer Boy has gone since Season One. Austin mentions that someone saw his photo. scouted him- and he’s became a wrestler. Anyone else thinks he looks like the undertaker? Lol. Does James remind you of the guy on Two Broke Girls?? Sort of that impish look. Still too soon to know for me. I think Vanessa as a poker player is making huge BB Mistakes. She is crying about her girlfriend to everybody. What happens is people have a cap on sympathy 1-2 times… but when it is with everyone and for a looooong time basic BB Nature is it becomes annoying as hell because unlike the real world you can’t get away or make a polite excuse… or even avoid her when you see her coming.. let it go to voice mail (I know that sounds horrible but a guy I know is a crier and so is my older sister… love them to death but I sometimes avoid them… sorry). She also has made an obvious alliance with Rocker Dentist. From what I can discern is that she gave Austin some sort of immunity, my guess is they were the first battle of the block winners. She may be concerned because it looks like Jace is the actual target this week and his biggest ally is Austin. The original plan may have been to have Vanessa throw the Battle of the Block so hopefully use the POV on her and put up Jace…. Bad Plan if that was the case ad her winning was a smarter move… because in the PoV Austin would have picked Jace and if Jace won he would use it on Austin and both would be safe. So if that was the case she did them a huge favor. So if the move for crying is a ploy… that is her bad move. Audrey is also playing to strong to fast… at this point you really want to look at the ones that do game talk but don’t look too power hungry or maybe somebody you may discount….. Audrey saying “I now understand why strong players hate floaters… you never know what they are thinking.”…. bad move Audrey….. bad move. I’M GONNA BITE MY WAY TO THE END OF THE GAME! Is Audrey already talking about Floaters week 1? I can’t (girl you wouldn’t know a true Floater if they were playing you to your face). I’m glad to see her playing the game, but she’s playing the game like a race, and will more likely than not only win herself a early ticket out the door. If it was a 7-6 vote to keep anyone over Jackie things would be interesting moving forward. She can play a bit wild because people will not target her yet because she’s the first transgender. Either they will avoid targeting her early or production will step in to shield her in some way much like mango last year until his meal ticket finished with the grammys. Austin and Jace are super catty and annoying. Audrey is playing way too hard and she’s gonna get burned for making too many alliances and losing peoples trust. I hope Da’Vonne lays low and let’s these people take each other out while quietly maintaining relationships with the outcasts in the house like Vanessa, Steve, and Becky. I love this show,and because of storms I lost most of last nights show!!!!! !What happen to having 2 HOH?Anyone?